2 new Jenny + Sandy events! If you've ever been with me and Jen in a room discussing a book or some such, you may have noticed that we interact quite energetically, especially when we disagree. There's nothing better than finding a common space, and a person you can really chew things over with, and we cherish our sit-downs because of that. In fact both of us have raised our kids to consider getting up and moving to another table (figuratively) when everyone at that table is nodding in agreement. How can we nuance our notions if we don't reach out on conversational occasion and prompt, "that's so interesting, tell me more about that?" Me and Jenny and PPB have some new events we think you'll like if you like interacting as much as we do; in fact, we think it's the most important thing to be able to "Get Their Point While Making Yours." First, you can't miss Jenny's new show a week from Thursday. She will talk all about how we communicate: how we invite others to share ideas, and how we in turn can be authentic and interesting and persuasive— at home, at work and even at holiday parties. This new show is based on new books you'll want to read for sure. 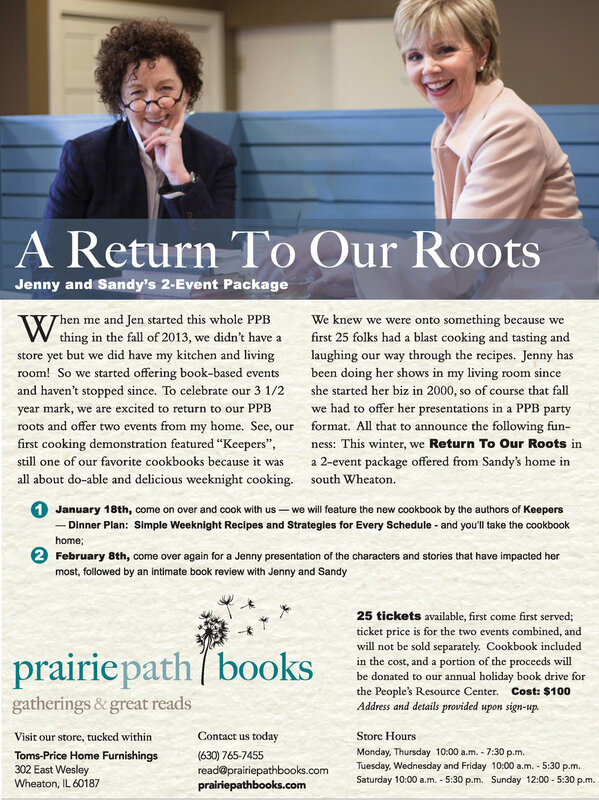 Second, me and Jen are offering two private events in my home to sort of get back to our "pre-PPB" book-selling selves - when we offered all events out of my home. We're calling it a "Return To Our Roots." Before we had a store we had book-based, candle-lit, intimate gatherings that were very personal. Now we are bringing the vibe back in a package of two events. You will join us not only in heartfelt conversation as we cook from a new and favorite cookbook, but also as we circle 'round a few weeks later in a private discussion of new books and ideas. This event package is extremely limited in seating, as it's in my home, so tickets are going fast — plus a significant portion of the proceeds from this ticket will go to our annual holiday book drive for the children visiting the People's Resource Center between November 15 and December 24. Last, me and J are planning a series of mid-winter events based on the "Art of Conversation." Look for information on New Year gatherings under this banner in the coming weeks. Energetic exchange of ideas—it's our most important thing.